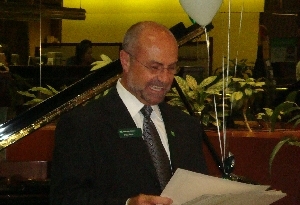 The annual TD Canada Trust Road Show was held on Friday July 24, 2009 at TD Canada Trust Richmond Hill branch on 500 Highway 7 East. As part of Euromusic Centre’s continued support in musical development and goodwill, fourteen young talented musicians from Euromusic school were invited to participate in what has become a great annual tradition at TD Bank. Served with complimentary snacks and drinks, customers and bank staff alike were treated to a 2-hour feast of fun and exciting piano performances. Pop songs, movie themes and ageless classical pieces were performed before a crowd of appreciative customers, staff, parents and teachers. On hand for the show was TD Canada Trust Richmond Hill Branch Manager Paul Rizzi, School Principal of Euromusic Centre Grace Lin, Euromusic Mar. Paul Rizzi is an active participant of music programs and generously supports Euromusic Centre’s annual Markham Music Festival which showcases hundreds of young pianists in the festive and friendly piano competition. SEE YOU NEXT YEAR AT THE TD BANK ROADSHOW!